Michigan State Spartans head coach Mark Dantonio celebrates after Michigan State Spartans beat Stanford Cardinal 24-20 at the Rose Bowl. PASADENA, Calif. (AP) — Michigan State coach Mark Dantonio says his "intentions are to be at Michigan State" and not change jobs. 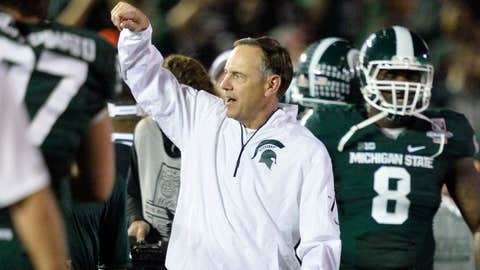 Dantonio is reportedly a coach Texas has been considering as a possible replacement for Mack Brown. After Dantonio led the Spartans to a 24-20 victory over Stanford in the Rose Bowl on Wednesday, he was asked about being linked to some high-profile positions and the possibility he could have a big raise and contract extension coming. Dantonio said: "That’s very flattering, but it would be hard to leave these guys. So while it’s very, very flattering, my intentions are to be at Michigan State. That’s all I’ll say about those things. I’ll look forward to seeing my guys back on Monday mornings for classes."